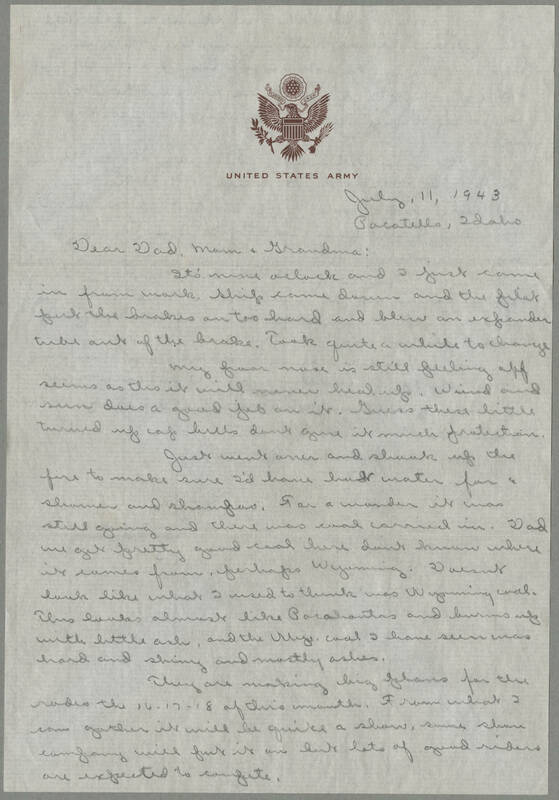 July, 11, 1943 Pocatello , Idaho Dear Dad, Mom, Grandma: It's nine oclock and I just came in from work. Ships came down and the pilot put the brakes on too hard and blew an expander tube [illegible] of the brake. Took quite a while to change. My nose is still peeling off seems as tho it will never heal up. Wind and sun does a good job on it. Guess these little turned up cap bills don't (don't) give it much protection. Just went over and shook up the fire to make sure I'd have hot water for a shower and shampoo. [For?] a [wunder?] it was still going and there was coal carried in. Dad we got pretty good coal here dont know where it comes from, perhaps Wyoming. Doesnt look like what I used to think was Wyoming coal. This looks almost like Pocahontas and burns up with little ash, and the Wy. coal I have seen was hard and shiny and mostly ashes. They are making big plans for the rodeo the 16-17-18 of this month. From what I can gather it will be quite a show, some show company will put it on but lots of good riders are expected to compete.